Lived in a house I didn't want to live in. House was full of clutter, stuck. Really was buried and full of fear to tackle it. With white sage burned and feng shui activated, wore and burned this oil night and day until it ran out. I ordered for the first time this oil to bring blessings on my house. I have not been observed sudden changes but it is more peace in my house after I used in floor washing! 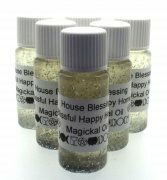 I ordered for the first time this oil to bless my house. I have not been observed sudden changes but it is more peace in my house after I used in floor washing!